Seasonal specialties are also a mainstay at Hartford Floral Supply, Inc., and we strive to continue our philosophy of using the best farms, growers, and producers available. Start with Nova Scotia Christmas balsam & wreaths, along with Oregon holly & lush decorative greenery from the Pacific Northwest. Combine the freshest boxwood, thick white pine and boxwood garlands from the mountains of North Carolina with finest locally grown Connecticut poinsettias, and it guarantees a holiday season of unparalleled beauty. Bulb plants and Easter Lilies from local Connecticut growers, as well as the best Canada has to offer makes certain each holiday season is complete with tradition and eye-popping color from best growers in the business. 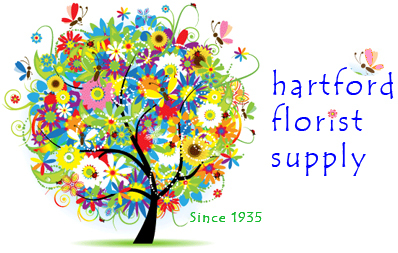 Whatever the season, and whatever your needs, Hartford Florist Supply and its staff are ready to serve you with the best the world has to offer.